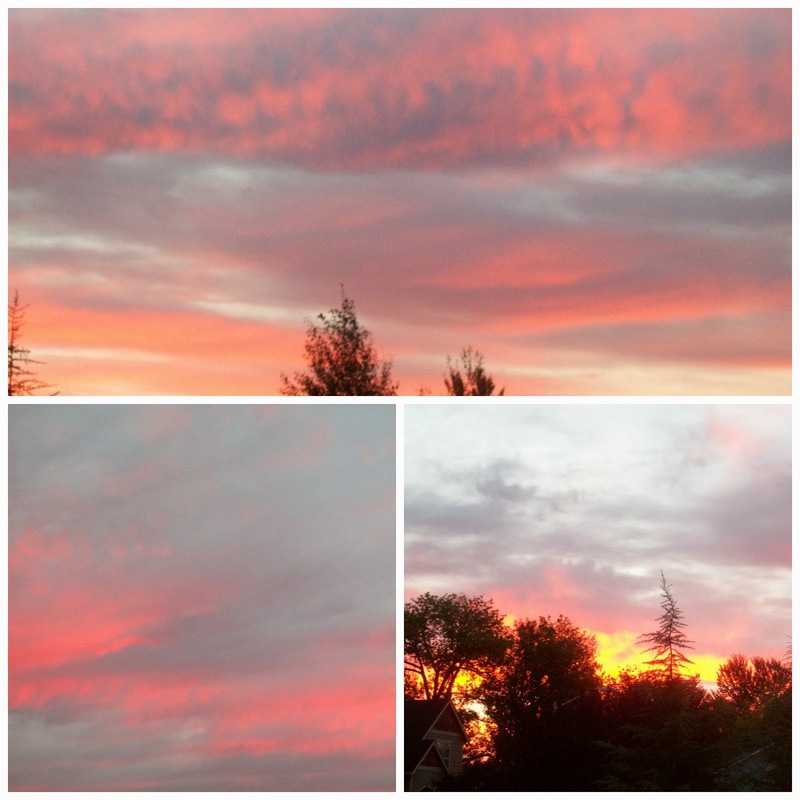 This morning I was greeted by the most beautiful sunrise as I was helping get the rest of the family out the door for school and work. This week I was featured on two different blogs, which was an exciting surprise! 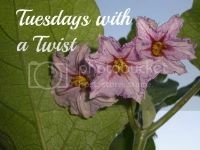 My Three Apple Recipes Post was featured at Tuesdays With a Twist. 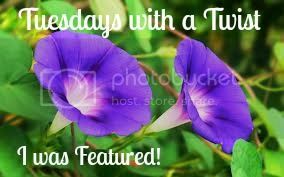 This is a fun link party with lots of wonderful posts to check out! I was also featured in an Inspires Me post at Barefoot In Blue Jeans, Barefoot In Blue Jeans is a wonderful blog written by the daughter of one of my dearest friends. What a special and happy surprise this post was for me! Thank you Courtney! This past couple of weeks we have been busy with many fun events. 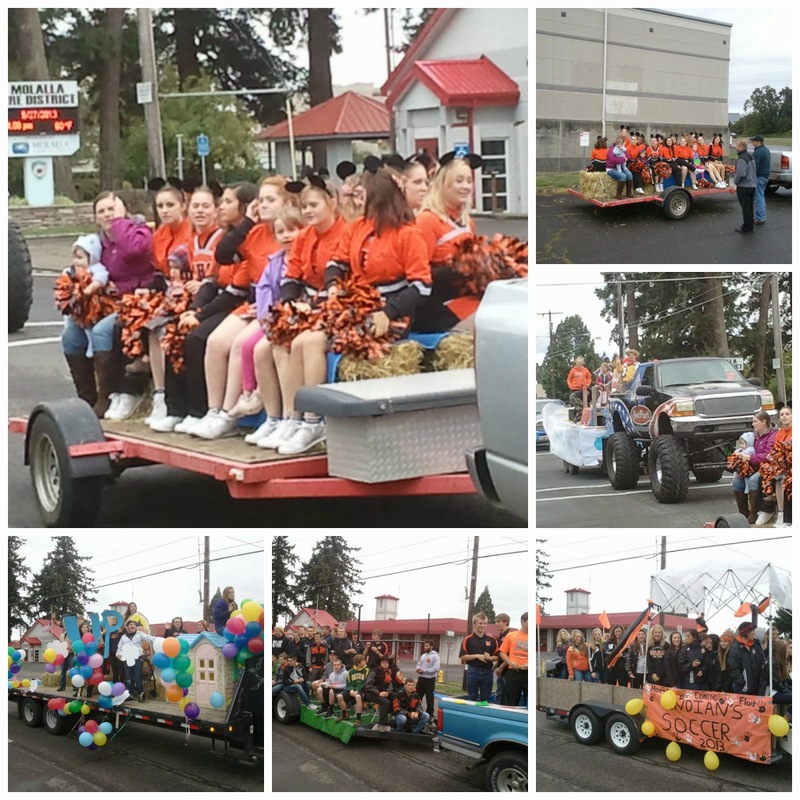 This past week was Homecoming Week here in town. The high school put on a parade through town with floats representing the different sports teams, clubs, all four classes, and the princesses. Homecoming had a Disney theme, so many of the floats were decorated with a Disney movie or character theme. Joe's girlfriend is a captain of the cheerleaders, they had a very cute Mickey Mouse theme, and played the 1980's pop classic "Mickey" for their float. The football game was fun, we had quite a turnout! The stadium was packed! 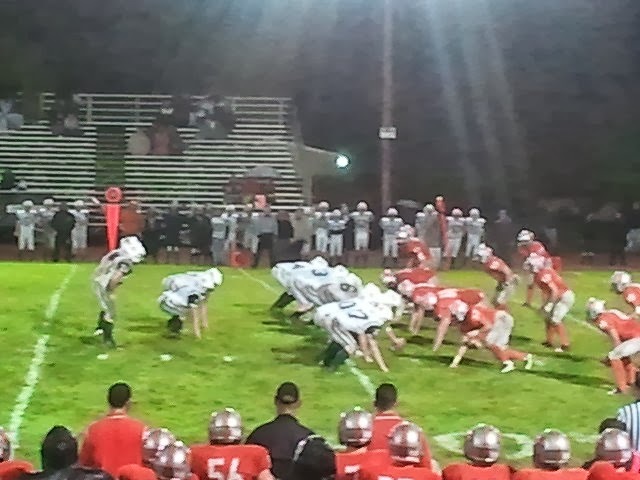 Just like last year, the rain came down through most of the exciting and close game, unfortunately we ended up losing in the last few minutes by 3 points, still a great game though! The Homecoming Dance was Saturday evening. Last year, my post about Homecoming was titled It was a Dark and Stormy Homecoming, and I think this year we may have had an even darker and definitely stormier homecoming weekend. The rain was torrential, and the wind was blowing! Not great for all the girls in their fancy dresses and high heels, but Oregonian girls know how to handle the rain, so it was all good. :) Joe and his girlfriend Lorene looked great, and had a nice evening at the dance! September was a fun and eventful month. September started with back to school week for Joe, and our fun weekend at Oktoberfest. 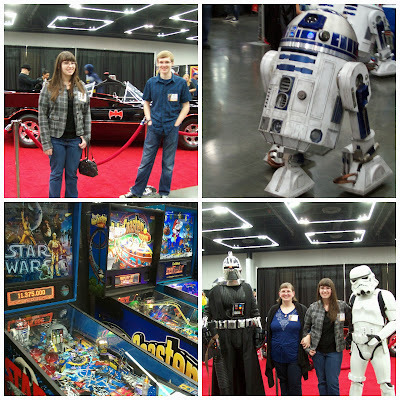 A couple weekends ago we also had the fun of attending the second annual Rose City Comic Con in Portland. We had a lot of fun last year's 2012 Comic Con, and were excited to check it out again this year. We didn't have as much time as last year, we could only attend Sunday after church, but we were excited to make it in time to attend a panel with some of our favorite actors from the Sci-fi series Stargate. It was fun to hear the actors talk about working on Stargate as well as some of the other shows they have done, I think it is always interesting to see what actors are like in person. They were all fun to listen to, the panel was one of the highlights of our day. My sister has a booth at Comic Con for all of her handmade crocheted sci-fi themed hats, which are always a hit. 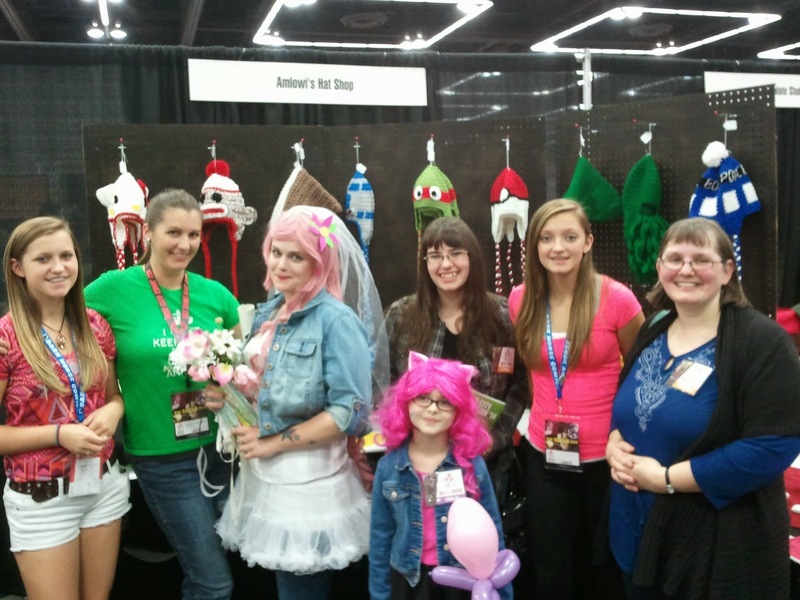 My other sister was also at the convention, all dressed up with her family. I was so happy to get this picture with my two sisters and all of our daughters. What a fun day we all had! Brown hamburger in a pan with the dehydrated onions until browned and cooked thoroughly, drain any excess grease. In the same pan stir in to the hamburger, soup, milk, sour cream, and pepper to taste, stir until combined. Pour into a greased large baking pan, mine is a 14 by 10 inch roasting pan. Then top with 1 cup of the cheese. 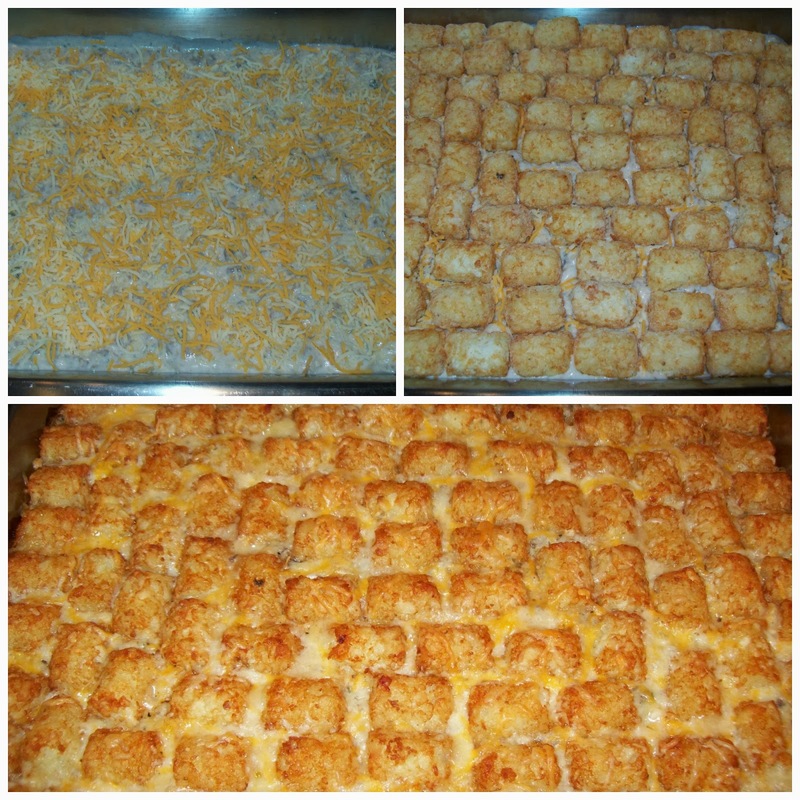 Then cover with a layer of tater tots. 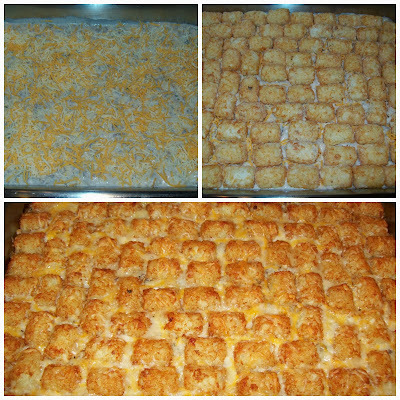 Bake for about half an hour until tater tots are golden brown and cooked through and casserole is bubbly hot. When the casserole is nearly done, for the last five minutes top with the remaining 1/2 cup of cheese, and cook until cheese melts. This is a delicious casserole that everyone enjoys, we also love left overs the next day for breakfast with our eggs. 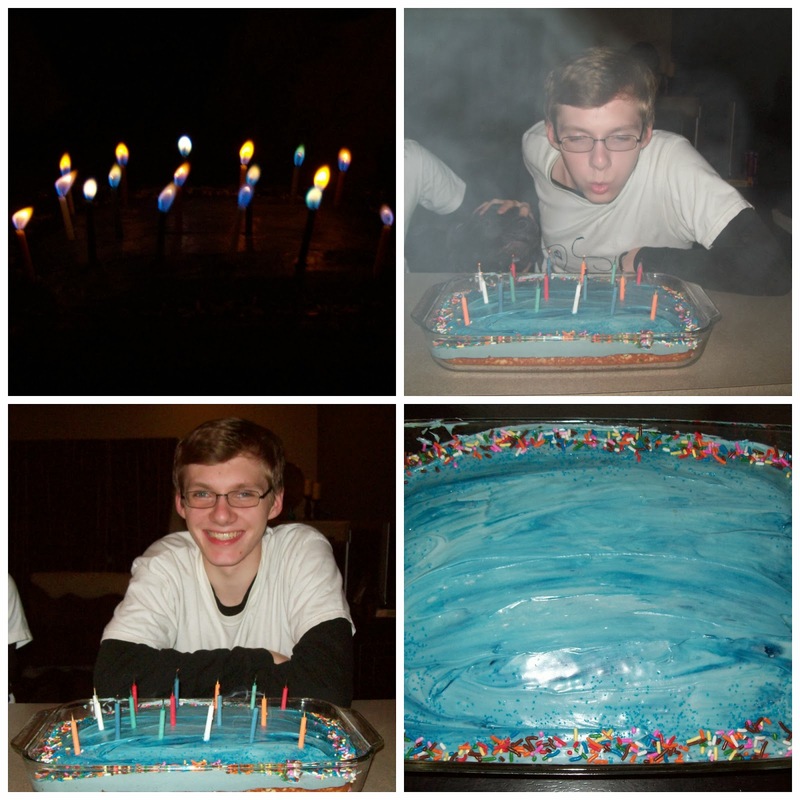 We also celebrated Joseph's 17th birthday in September. We found candles that had different colored flames, they were pretty fun. We had a nice dinner and some fun presents. Happy Birthday Joe! This week Sarah started her first day day of college, and is enjoying being back in class after a long summer recovering from her accident. She is continuing to heal, and is doing very well. Thanks so much for stopping by!! Looks like you have been quite busy! !